As we start living longer and more productive active lives, even losing the form and function of one tooth too early can become a health issue and very upsetting. Dental loss is a serious matter, when multiple teeth are lost, your jaw bone begins to shrink “atrophy” due mainly to the lost function or physiological stress. 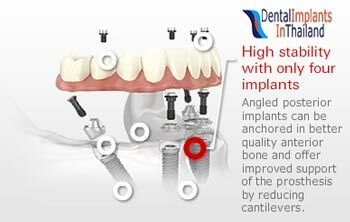 If you have lost a few teeth, why not come to Thailand for our inexpensive All-on-4 dental implants in Bangkok Thailand. Our pre-approved implant specialists offer revolutionary simple and effective methods to create permanently fixed yet natural looking set of beautiful white teeth in a short holiday! Generally, surgically placing titanium implants in the jaw provides a quick and minimally invasive solution for replacing your teeth. The titanium implants also help stabilize the bone volume needed to keep the overall jaw healthy. For our international clients who maybe lack enough bone mass, we offer the best alternative that is changing lives daily,the All-on-4 implants. 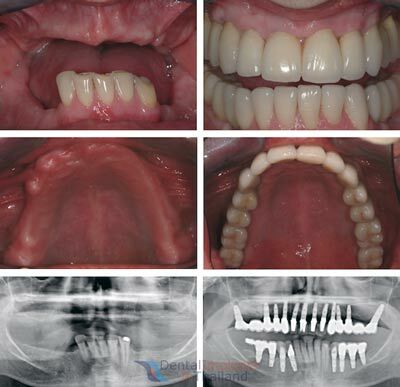 By placing only four implants and then tilting the posterior 2 teeth to allow clients with very little even no bone mass. Clients who already know that they lack sufficient bone mass may feel slightly discouraged from dental implants or told by their home dentists that they need painful and costly gum grafting or bone grafting before they can place dental implants. All on four and mini intra-lock implants do not require any painful bone grafting and can help anchor a full set of upper and/or lower teeth with or without porcelain veneers in just a few days. 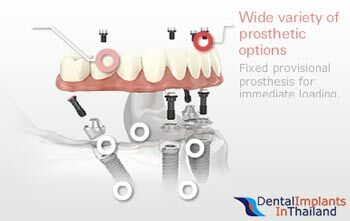 Get All-on-four implants without any hassles or delays that are so common with conventional implantologists abroad. 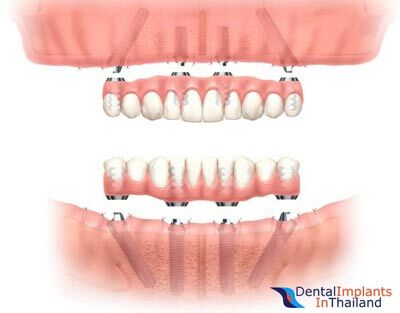 By making use for custom angulated dental implants our Accredited team of Thai Dentists are able to create and install new implanted teeth to look and perform exactly like natural teeth in as little as 3 to 5 nights in Bangkok. We use only genuine implants from companies such as Nobel Biocare who pioneered the use of Immediate load dental implants. Get results fast by getting Zygomatic Implants, All-on-6 Implants and even All-on-8 dental implants for 35%-65% less only at the Dental center of Thailand. Affordable Luxury! All-on-4 with Smile Makeovers at Thailand dental center costs nearly 60% less than the exact same treatments in your home country. Reduced success rate in patients who have a history of periodontal disease or smoke. The dental Center of Thailand strives to provide you with the best all on four specialists in Thailand for the prices. In-lieu of a face to face consultation our dentists request some basic medical/dental history along with any relevant information such as a copy of your recent dental exam (X-ray or Dental CT Scans are the most accurate). Once our dentists in Bangkok or Phuket understand your exact needs we can provide you with no-hassle fixed pricing along with optional hotel packages to help you achieve the best results in just a few nights. To get prices and multi-area discounts for for All-on-4 implants discounts offered for multiple treatments such as bridges, inlays & onlays. Dentist Prices in Phuket are generally 25-30% higher than Bangkok. To see if you qualify for treatment and additional discounts or to speak to a dental specialists about more about your planned laser teeth whitening & cosmetic dental holidays please contact us. We know Thailand!